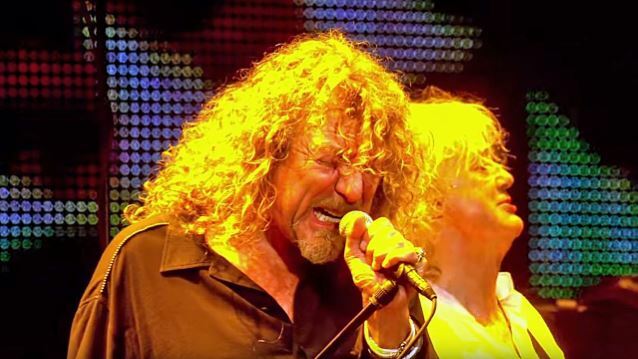 According to The Pulse Of Radio, LED ZEPPELIN issued a press release featuring a May 2018 photo of surviving members Robert Plant, Jimmy Page and John Paul Jones hold the working draft of their upcoming book, "Led Zeppelin By Led Zeppelin". The tome will be published in October by Reel Art Press in celebration of the 50th anniversary of ZEPPELIN's formation. The press release read in part: "Work on the official book 'Led Zeppelin By Led Zeppelin' is almost complete. The images have been carefully selected and annotated throughout by Jimmy Page, Robert Plant and John Paul Jones. Celebrating 50 years since the band's formation, it covers the group's unparalleled musical career and features photographs of LED ZEPPELIN on and offstage from their very first moments together. This definitive 400-page volume includes previously unpublished photos, artwork from the LED ZEPPELIN archives and contributions from photographers around the world. There will be regular updates and sneak previews showing the work in progress. Stay tuned." Page told The Pulse Of Radio that ZEPPELIN's initial influences from across the Atlantic solidified the type of music they would create over the years. "The fact is, all four of us, were so influenced by American music, and for me, the music that I was hearing in the sort of '50s over here, it was all a reinterpretation of what was going on in America," he said. "So we, sort of, had this American music, sort of coming in to us, and we were accessing it through the radio and records. That's a major part of why we became what we were — which is musicians and became totally seduced by this whole movement in music." Released this past March was a newly remastered reissue of the LED ZEPPELIN 2003 live collection, "How The West Was Won". The set, which features new remastering supervised by Page, marked the first offering from the band in celebration of its 50th anniversary this year. "How The West Was Won" was originally released on May 27, 2003 featuring tracks culled from two Southern California shows recorded at the L.A. Forum on June 25, 1972 and Long Beach Arena on June 27, 1972. Page sequenced the set to replicate a single concert from beginning to end.